With a strong family tradition of excellence in the St. Louis real estate industry, Federer & Federer, P.C. gives clients the benefit of real estate and business attorneys with over 140 years of combined legal experience. 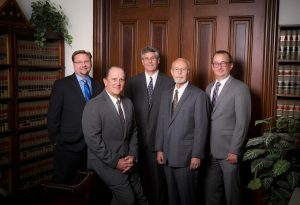 We represent a diverse range of clients including investors, business owners, homeowners, lenders, contractors, subcontractors, developers, builders, title companies, real estate brokers, agents, and other real estate professionals with their legal needs in the areas of real estate transactions and litigation, construction law and litigation, and business law and litigation. At Federer & Federer, P.C., we are proud of the reputation our family has built in the real estate field. William Federer was an early land developer in St. Louis, and the Federer name has been synonymous with St. Louis real estate ever since. Attorney Richard Federer started out as a real estate broker before attending law school. Richard has served as President of the St. Louis Board of Realtors and his depth, knowledge and experience with Missouri Real Estate Law dates back to 1952. This legal tradition is now carried on by the President of our firm, attorney Thomas Federer, who has been licensed to practice law in Missouri since 1987. He has been a speaker for the Missouri Bar covering the annual update on Real Estate Law, presented to lawyers and other real estate professionals throughout Missouri. He has served as Chair of the Real Property and Development Committee of the Bar Association of Metropolitan St. Louis and as chair of the Real Estate Law Section of the National Lawyers Association. He has also served as former board counsel for the St. Charles County Board of Realtors. Our attorneys work hard to instill your trust in our firm with prompt communications during engagements, consistently providing advice, answering your questions, dealing with your concerns in a professional manner and guiding you through difficult situations. Because we have the insight that comes with working in both transaction and litigation work, our clients benefit from legal advice that is well-balanced. We know which contract provisions are worth negotiating and how they will be enforced by the courts. We invite you to contact us to set up an appointment to meet with us. We will sit down with you to listen to your concerns and give you straightforward advice. Our business hours are from 8:30am to 5:00pm Monday through Friday.